Siberian tiger is a subspecies of tiger known by the scientific name Panthera tigris altaica. 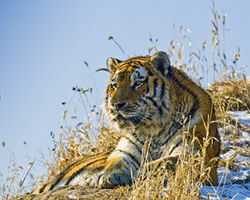 It is also commonly known as the Amur tiger and is the largest tiger of all. Their fur possesses the ability to change shades to help with camouflage. Because of the high poaching rate of these tigers, they nearly went extinct in the 1940s with only about 40 of them left, but thanks to WWF (World Wide Fund for Nature) and other conservation groups, the number of Siberian tigers is kept around 400. A Siberian Tiger in its environment. Notice the length of the tail compared to the rest of the body. 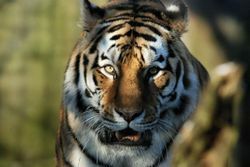 The Siberian Tiger is the largest cat in the world, even though the male and female's weight are drastically different. Where the male weighs about 300 pounds, the female weighs around 400 pounds. Their average length is thirteen feet, with their tail being about three feet long. What makes them unique from other tigers is that they have fewer stripes that are more spread apart and paler than those of other tigers. Unlike the other tigers, a Siberian Tiger has a mane. The fur on their mane helps them keep warm in cold environments. Their fur is orange with dark brown stripes and random white splotches. During the winter, their fur lightens, allowing for better camouflage while hunting and can grow to about twenty-one inches. They can reach a speed of fifty miles per hour while running in the snow. The Siberian tiger is about three-and-a-half feet tall to the shoulder. Even though the Siberian tiger's shoulders and front legs are stronger, it uses its hind legs, because of their greater length, for jumping. They use their tail, which is about 1/3 its body length, for balance, especially when in pursuit of prey. Their ideal time for hunting is during the night, because they are nocturnal. Their ideal vision, which is six times better than that of a human, helps them see well in the night. A mama Siberian Tiger with her three cubs. A Siberian tiger can live up to 25 years, when in its natural habitat. They reproduce sexually, and their mating season lasts all year, but the winter months of December and January are the most popular. The male leaves the female right after mating. If the first litter dies, the female can produce another one within five months.The gestation period is about three to three-and-a-half months. Females give birth anywhere from two to six cubs. When they are first born, the cubs are the size of a house cat, blind, and have no teeth. They begin to establish vision and grow teeth at about two weeks old. Within their first year of life, the Siberian tiger's cubs begin to hunt by themselves and become independent by one-and-a-half years old. However, the cubs only leave their mothers when they are three to five years old. 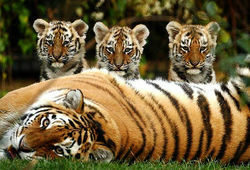 Since these tigers are endangered due to deforestation, on average, only one cub from each litter survives to maturity. 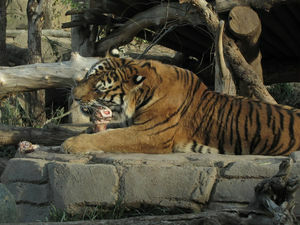 Some Siberian tigers are placed into zoos where they and their reproduction can be monitored. The Siberian tiger has a few other common names including the Amur tiger and the King of Taiga. There are only about 500 of these animals left in the world. ↑ Panthera tigris altaica Wikispecies. Web. Late Update September 5, 2013. Unknown Author. ↑ Smith, P.A. Siberian Tiger Animal Fact Guide . Web. Date of Access March 23, 2014. ↑ Siberian Tiger Basic Information Angel Fire. Web. Date of Access March 23, 2014. Unknown Author. ↑ Siberian Tiger Blank Park Zoo. Web. Date of Access March 23, 2014. Unknown Author. ↑ Tiger (Siberian) Young People's Trust for the Environment. Web. Date of Access March 23, 2014. Unknown Author. ↑ Tiger Ecology Tigris Doundation. Web. Date-of-access April 5, 2014. Unknown Author. ↑ Ecology and Lifestyle Siberian Tiger. Web. Date-of-access April 5, 2014. Unknown Author. ↑ Overview World Wildlife. Web. Access Date April 5, 2014. Unknown Author. ↑ Russia Wildlife Conservation Society. Web. Access Date April 05, 2014. Unknown Author. This page was last modified on 7 January 2016, at 14:30.